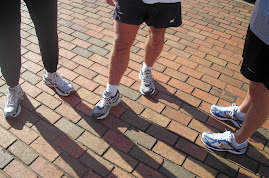 The results from Saturday's Founder's Day 5K in Lexington are posted at the ShoalsTrac website. The overall winner (18:42) was Brandon Black, 29, of Birmingham. I don't know if this is the same guy, but there's a runner right around the same age who is a native of Limestone County. I haven't seen him around in a while so, maybe he's moved to Birmingham and was in town this weekend. If so, Great Job, Brandon! If not, Great Job, Brandon! Either way! The event also featured a one-mile fun run. Don't forget to check out the latest update to our Duck & Run registration list. It's not too late to take advantage of $12 pre-registration with entries postmarked no later than Friday, Sept. 12. Click here to download your printable form!